Camera detectors, perhaps, are the most versatile and optimal in terms of price-quality ratio of the detector. Easy to install and configure, they are good at most tasks – control of the stop line, detection of machine queues (you need a separate camera). They were designed to replace inductive loops, therefore they have a similar algorithm of operation – they determine the presence or absence of machines in the specified zones – so-called “virtual loops”. 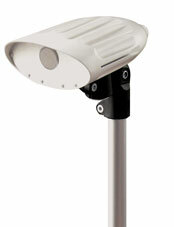 XCam-P is a video detector installed above the road surface for monitoring and controlling traffic. The processor integrated into the detector processes the video frames and automatically detects the presence, absence or stopping of the machines within the predefined virtual loops. Camera detector CITILOG XCam-P comes with several options for lenses, it has a vandal-proof housing. It covers up to 4 lanes, the range of operation depends on the lens and the height of the installation. The detector can transmit data directly via Ethernet, RS485 or through an interface board with a dry contact output to the road controller or control center. The controllers KDK-06 implemented the protocol CITILOG and the interface card for the connection is not required. Detectors belong to type I according to DSTU 4157-2003. XCam – I for the detection of accidents, abnormal situations for bridges, tunnels and freeways.